The 6th edition of the video night at Le Cube – independent art room is dedicated to the work of Marie Ouazzani (born in 1991 in Lille) and Ghita Skali (born in 1992 in Casablanca). The two young artists, currently students at the Villa Arson, National Academy of Art in Nice, present several videos and projects in progress. 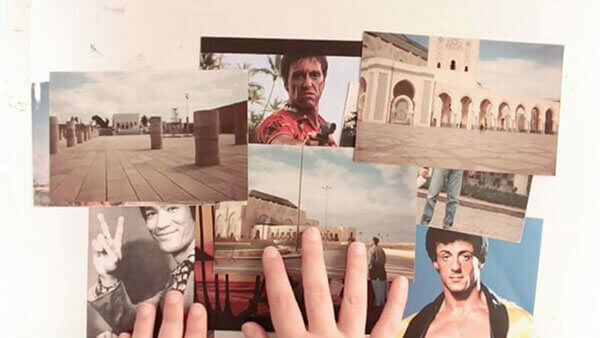 Marie Ouzzani is screening notably Les héros de mon père (2013), on visual and cultural references cherished by her father, ranging from Sylvester Stallone and Jackie Chan to Moroccan images and colonial exhibitions. Another video bridging the collective imagination and familial history, Les chevaux de la Puszta joins fantasia to the introductory text of Edward Said’s Orientalism. Ghita Skali presents as well two recent videos: Dear God, a work about a petition sent to God by mail, but the address could not be found. The other video work The Eiffel tower, treats plural memories narrated by the inhabitants of Fes about an Eiffel Tower that would have been installed on a roundabout in the city, in 2013. This evening is also the opportunity for Marie Ouazzani and Ghita Skali to present the current tracks of a project in progress on Orientalism and how it is perceived in Morocco and France. It is in fact a space for exchange, open to the public. The artist’s talk is hosted by Katrin Ströbel, artist and professor at the Villa Arson, and Elisabeth Piskernik, director of Le Cube. The video night #6 is produced in partnership with Villa Arson, National Academy of Art in Nice.